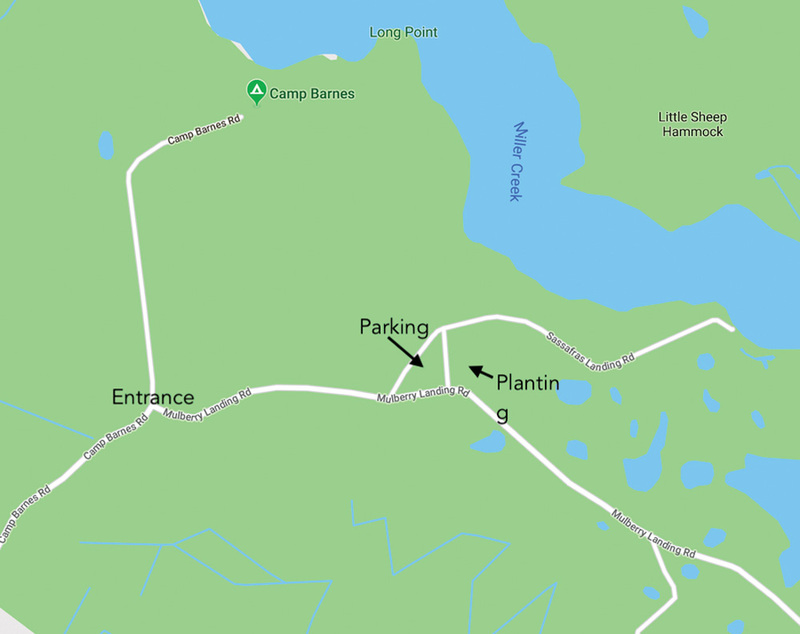 A map of the Assawoman Wildlife Area showing the exact location for the planting and parking. Fall is traditionally a time to appreciate the harvest that the land has provided, and this year, there’s a way for local ghosts, goblins, princesses and pirates to give something back to the Earth. The Center for the Inland Bays will host its first “Trick or Tree-t Planting Party” on Saturday, Oct. 20, from 10 a.m. to 1 p.m. The planting will take place on Mulberry Landing Road, at the edge of the Assawoman Wildlife Area near Bethany Beach. About 300 trees will be planted at the site, according to CIB spokesperson Katie Young. Among the native hardwoods to be planted are mockernut hickories, blackjack oaks, swamp white chestnuts, persimmon and black haw viburnum. In addition to planting trees, participants will have an opportunity to explore the significance of trees in protecting wildlife and water quality, make nature-friendly crafts and show off their festive costumes. The reforestation plan, Young said, “looked at both publicly- and privately-owned agricultural lands,” and prioritized them in the CIB’s Watershed Reforestation Model. Parcels that ranked “highest in the model were the ones that would provide the highest water-quality benefit if reforested or included in other best-management-practices projects. “Between 1992 and 2012, the Inland Bays watershed has lost 14 square miles of its important forested areas,” Young said. “Not only does this cause problems for the wildlife that depend on these forests, such as native birds, foxes and turtles, it also negatively affects the water quality of our creeks, rivers and bays,” Young said. The CIB is working with the DNREC’s Department of Fish & Wildlife on the reforestation project. The Trick or Tree-t planting event will take place at the spot where Mulberry Landing Road (the entry road for the Assawoman Wildlife Area) splits with Sassafras Landing Road. The planting will be adjacent to the fork in the road. Participants should follow the signs for parking. Young said that, although visitors would typically need a Conservation Access Pass on their vehicle in order to enter that area, that requirement will be waived for Trick or Tree-t participants who park in the designated area. For those who plan to return to the Assawoman Wildlife Area (or other state-controlled wildlife areas), passes for future use can be purchased from the State online at https://dnrec.alpha.delaware.gov/fish-wildlife/conservation-access-pass/. Fees for the passes are used to maintain and improve public access, facilities and wildlife habitat in Delaware state wildlife areas. For more information on the Trick or Tree-t event, look for it on www.eventbrite.com or call the Delaware Center for the Inland Bays office at (302) 226-8105.